Case covers are an affordable way to add some protection and style to your case. You may need products like this for protection in cold or warm climates. Or, maybe you just want the added convenience of extra music storage or backpack straps. If you have an old case and the attached cover is worn out, this is a good way to cover up the ugliness so you don't have to buy a new case. Nylon Exterior, foam padded, lined interior. Backpack straps and shoulder strap included. Large Music pocket, and two side pockets. Fits many other brands of case. 4/4 Only. Available in Black, Red or Blue. 2 Pounds. Thick foam padding, nylon exterior in Green, Black or Burgundy. Subway handle. Oblong models have a large music pocket. Shaped models have an accessory pocket. Deluxe model has backpack straps and shoulder strap. Oblong model for Violin fits cases up to 31.5" x 10.5" x 5". Oblong model for Viola fits cases up to 31.5" x 12.5" x 6". 1/2 inch foam padding, nylon exterior in Black only. Subway handle. Oblong models have a large music pocket. Shaped models have an accessory pocket. Choice of shoulder strap or backpack straps. Oblong model for Violin fits cases up to 31.5" x 10.5" x 5". 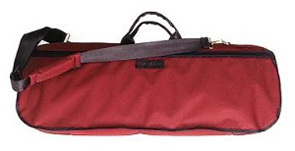 Oblong model for Viola fits cases up to 31.5" x 12.5" x 6".